Irina Radchenko has been at HSE since 2012. SAP Hybris Marketing course: certificate, License 782400020029. Science Communications online course: certificate. Data Scientist with Python Track (it contains 22 online courses): certificate. 38 completed online courses in Data Science (Python, R, SQL, Git, Shell, Spreadsheets): certificates. 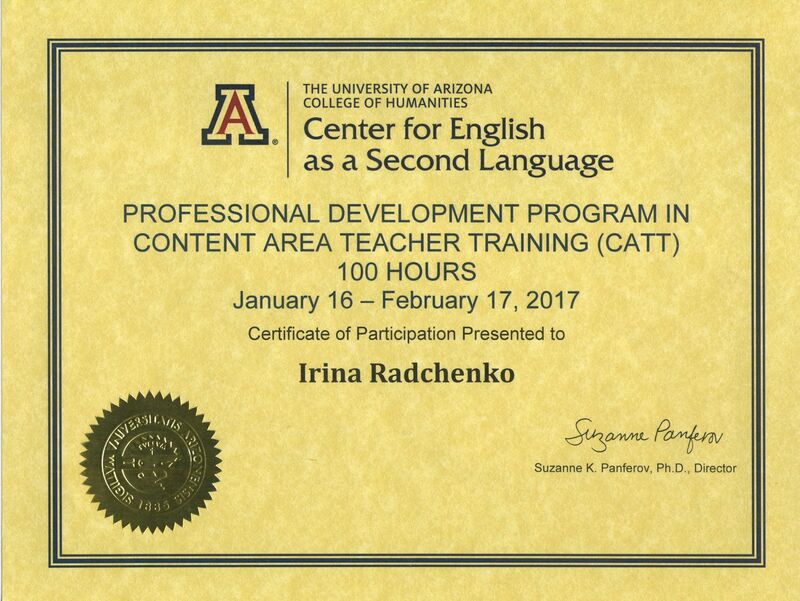 Content Area Teacher Training Program, University of Arizona, Tucson, USA. 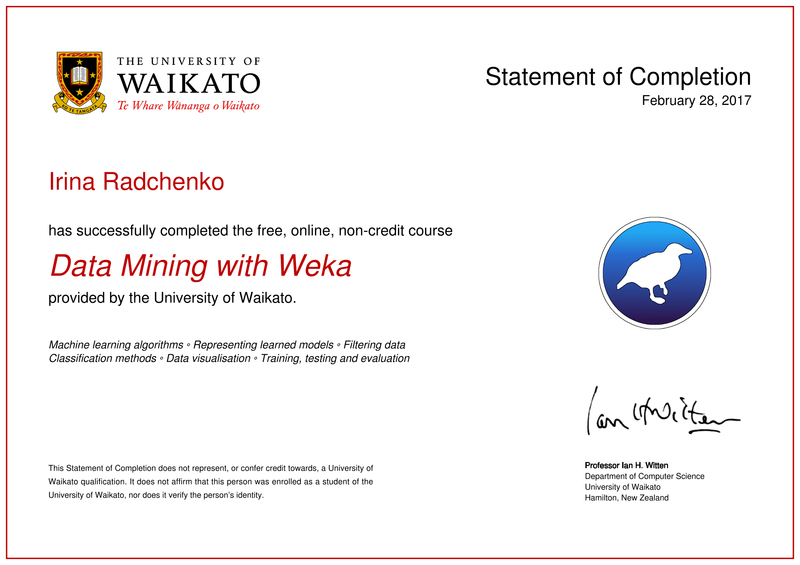 Data Mining with Weka online course (University of Waikato): certificate. Academic Development online course: certificate. 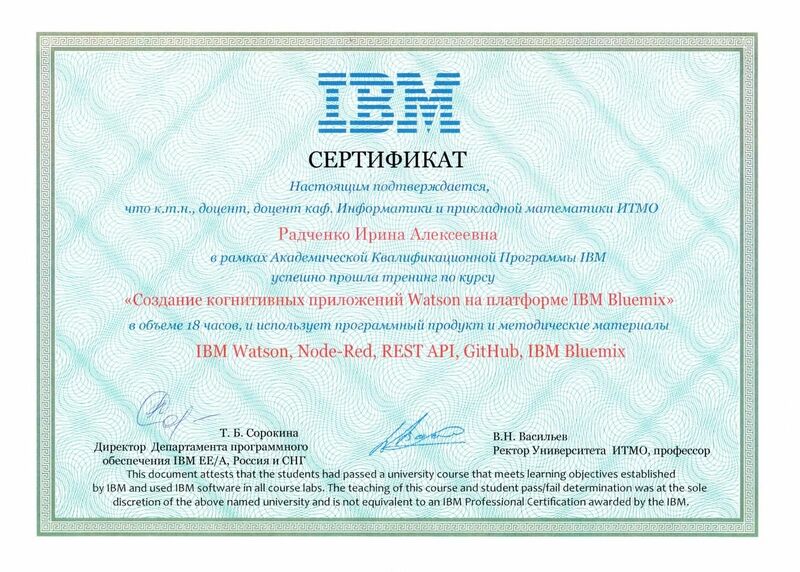 "Cognitive applications development with Watson on IBM Bluemix platform" online course: certificate. 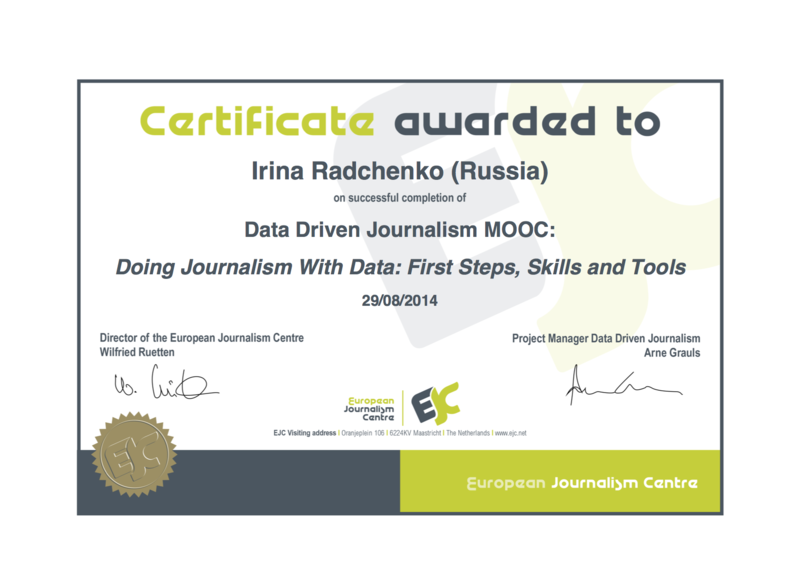 Doing Journalism with Data online course: certificate. 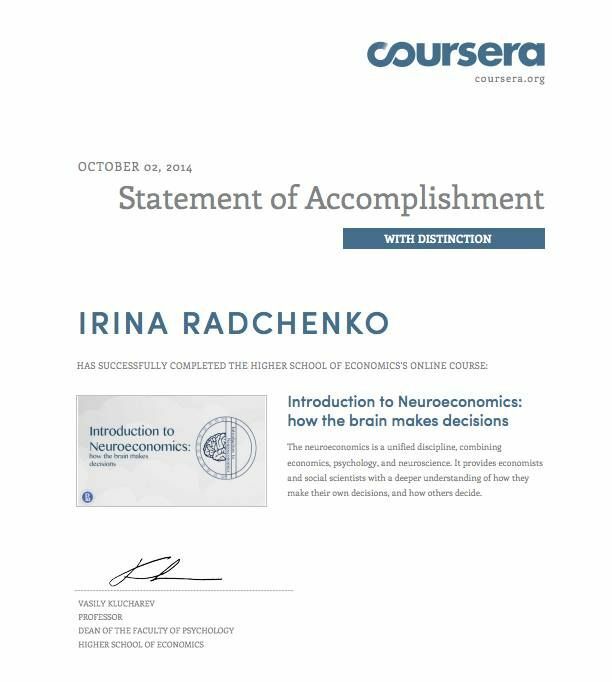 "Introduction to Neuroeconomics: how the brain makes decisions" online course: certificate. Chapter Radchenko I., Kayser-Bril N., Valeeva A. 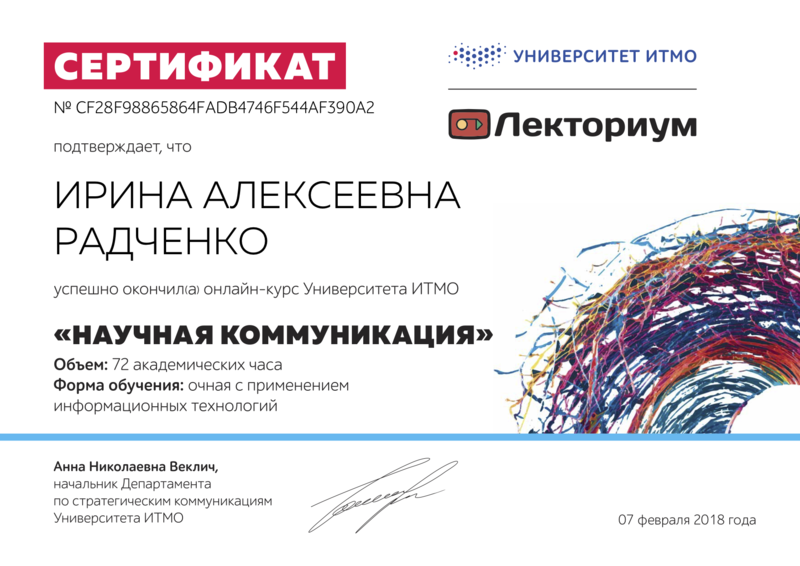 Transformation of Communication Processes: Data Journalism, in: XVI Апрельская международная научная конференция по проблемам развития экономики и общества: в 4 кн. / Отв. ред. : Е. Г. Ясин. Кн. 3. М. : Издательский дом НИУ ВШЭ, 2016. Article Радченко И. А. Использование открытых данных в научных исследованиях // Информационное общество. 2013. № 1-2. С. 93-101. Article Радченко И. А. Особенности использования программно-аппаратного комплекса, предназначенного для управления предприятиями и отраслями экономики, в рамках концепции Linked Enterprise Data. // Инженерия знаний и технологии семантического веба. 2012. С. 165-167. The development of Hardware and Software Designed for Enterprise Management and Economic Sectors of Modern Russia. The development of Russian Public Information Resource of Open Data in Science and Engineering, which will be integrated into LOD-cloud. 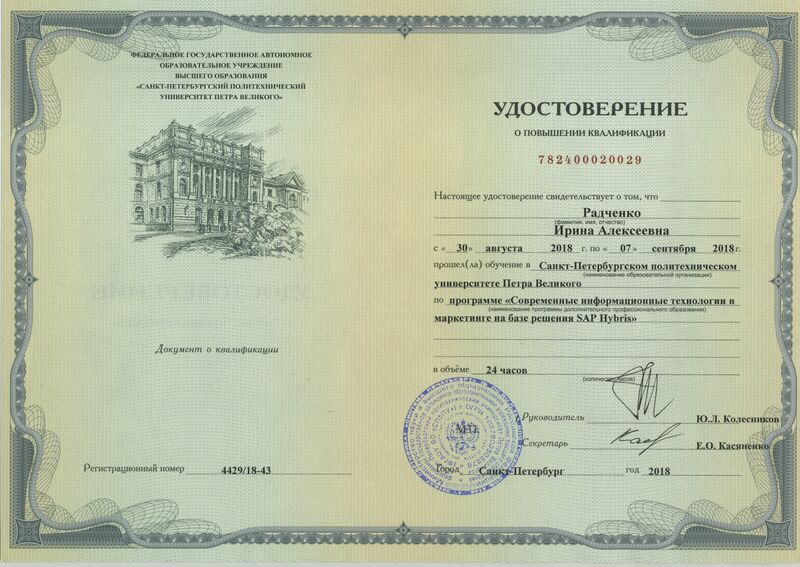 The development of the Open Data concept of Russian Federation for the State Contract № GK-142-OF/201, September 5, 2012 with the Ministry of economic development.